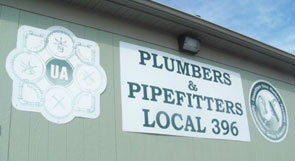 If you are interested in starting an exciting and rewarding career in the Plumbing and Pipefitting Industry, then look no further than The Local 396 Plumbers and Pipefitters Building Trades Apprenticeship. Our five year comprehensive program provides you with the skills needed to succeed in a constantly evolving industry, while allowing you to earn upwards of $60,000.00 as an Apprentice. Our State Accredited Apprenticeship Program consists of a minimum 8000 hours of “On the Job Training” and 1,150 hours of “Related Technical Instruction” (Classroom/Lab work). Once you are accepted as an Apprentice of Local 396 you will begin your field training while earning a “full time” wage with one of our Signatory Contractors. The classroom instruction runs from September through May, and all apprentices are required to attend two evening classes per week. After fulfilling the requirements of our five year program you will earn Journeyman status with the United Association. This classification is regarded as the Gold Standard in the Piping Industry and enables you to work anywhere in the United States and Canada.